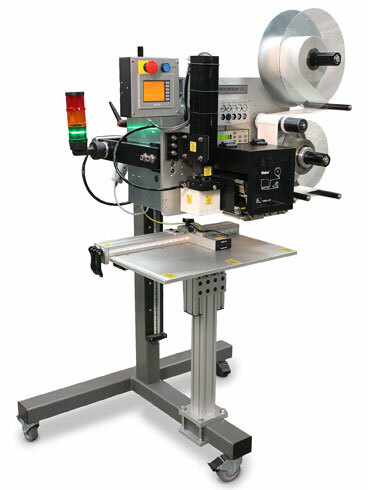 This adjustable jig fixture helps ease the transition from manual to semi-automatic labeling using a Weber tamp-blow, pressure-sensitive label applicator or label printer-applicator. With an adjustable X- and Y-Axis, this all-aluminum guide makes it easy to line up a product for consistent labeling every time. And it mounts directly to the labeling system's t-base stand so it is solid as a rock. You can make adjustments in a matter of seconds and your labeling will be accurate everytime. Easy-to-read increments are on both axis guides. The jig fixture is designed exclusively for easy attachment to Weber's heavy-duty t-base stand, which provides a secure mount for both the fixture and a Weber labeling system. The jig fixture's sturdy table and adjustable X and Y axis fences and recessed scales provide a workstation that facilitates operator involvement. • Quick-release knobs and levers enable the operator to adjust the guide fences to accommodate products or packages from 5" to 20.5" wide. 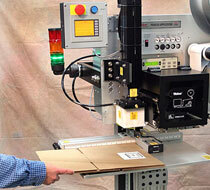 Label application is activated through the use of a footswitch or convergent proximity sensor. The jig fixture's t-base mount, table and adjustable fences are constructed of durable, lightweight aluminum. The unit's working surface covers over 440 square inches and is built to withstand the day-to-day wear of continuous labeling and product handling.